The lost heir to the kingdom of Saradyn has come forth, but without protection, he will surely fall prey to the deadly temptations of Lady Eliza Farrow, a vampire and the rival claimant to the throne. Only the swords of heroes can protect him and lead him safely to his rightful throne! 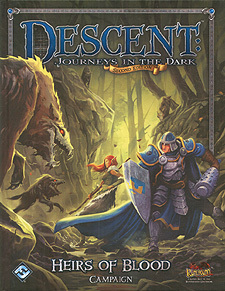 Battle to defend the heir to the kingdom in Heirs of Blood, a campaign for Descent: Journeys in the Dark Second Edition. Set in the hidden valley of Saradyn, this campaign takes you straight to the greatst war ever to wrack this secret kingdom. Each victory and defeat steers the course of the conflict and every decision you make has consequences as you come closer to the campaign's epic conclusion. With 32 completely new encounters, Heirs of Blood brings new adventures to Descent: Journeys in the Dark Second Edition.